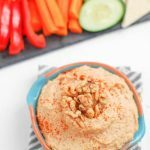 This Spicy Walnut Hummus with Roasted Garlic is made without tahini and the nutty walnut taste is balanced perfectly by the spicy red pepper and mellow garlic flavor. In case you didn’t know, February is American Heart Month! Heart disease is the #1 killer of men and women in the United States. While there are some non-controllable factors that put you at increased risk for heart disease (gender, genetics, ethnicity, etc), there are several things you CAN control. Along with being physically active and not smoking, what you eat can have a big impact on your heart health. Making healthy food choices can help you manage your blood pressure, cholesterol and and blood sugar levels, all of which can reduce your risk for heart disease. As an RD, I love sharing heart-healthy food choices so when California Walnuts reached out to me about partnering with them to spread the word about walnuts and heart health, I jumped at the chance. Did you know walnuts are certified by the American Heart Association as a heart-healthy food? An ounce of walnuts (approx 12-14 halves) gives you 4g of protein and 2g of fiber and they’re only nut to provide a significant source of alpha-linoleic acid (the plant-based omega-3 fatty acid). More than two decades of research has shown that walnuts may help lower cardiovascular risk factors by decreasing LDL cholesterol by 9-16%, and diastolic blood pressure by 2-3 mmHg. These two factors are major contributors to heart disease risk, and cutting them is a critical step toward a healthier heart. Sounds pretty good, right? Even though California Walnuts has a GREAT recipe section on their website (check it out if you’re looking for some creative ways to add walnuts to your diet), I wanted to share a recipe of my own with you guys today as well! As you know, hubby and I are big hummus fans. We always have some in the fridge, along with some chopped veggies, for snacking. I’ve made several different varieties of homemade hummus but I’ve never tried adding nuts! Walnuts have a definite nutty flavor so I decided to add a mellow garlic flavor thanks to some roasted garlic to help balance it out and then, as per usual, I kicked things up a notch by making it spicy! A simple homemade hummus that’s the perfect balance of nutty and spicy with hints of garlic flavor throughout. In a food processor, combine walnuts and garlic and pulse until well chopped. Drain and rinse chickpeas, reserving ¼ cup liquid and add both to food processor. Add an additional Tablespoon liquid if you want an even smoother consistency. While I think hubby prefers to keep eating his daily nuts by the handful, this may be my new favorite way to enjoy them. I loved the flavor combo and the fact that you could actually taste the nuts in the hummus! Are you a walnut lover? What’s your favorite way to use them? Mine’s a three-way tie between toasting them to add to a salad, adding them to a banana muffin or this hummus! 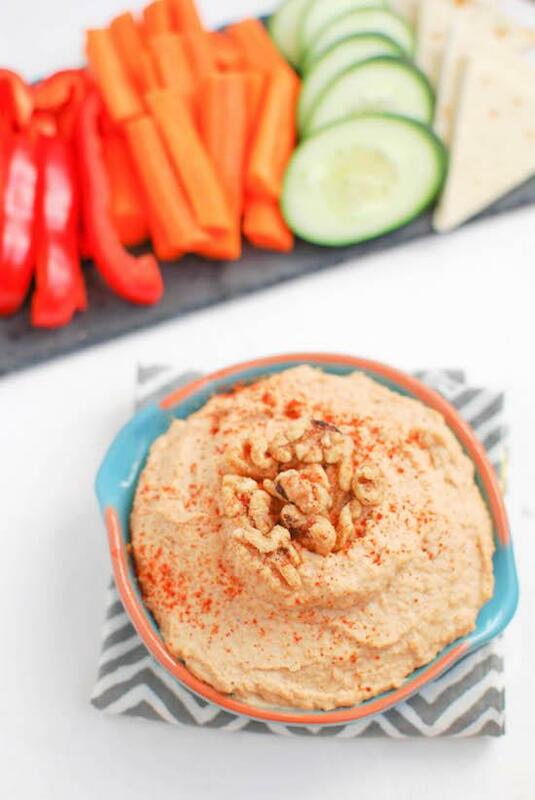 A heart-healthy snack: Spicy Garlic Walnut Hummus from @LeanGrnBeanBlog and @CAwalnuts! I’ve seen walnuts in Pestos but never in a hummus- What a great idea, Linds! I love roasted garlic in hummus. I like the addition of walnuts for a nice nutty touch. YUm! Looks delicious! I wondered about making hummus myself but for some reason assumed it would be so much work. Looks effortless! And so good! i do like walnuts! i love making banana nut pancakes! Roasted garlic is my favorite hummus and I adore that you used walnuts as a base. Pinning! I agree. I’ve always assumed that making hummus would be a lot of work but it’s really not. This motivates me a lot to actually make it. Thanks for sharing! super easy! you should def give it a try! agreed 🙂 make it work! I love nuts in any form… this is such a creative way to use them, definitely trying this soon! Mmm, walnuts in hummus, so clever! My daughter is not a fan of the hummus I make with tahini in it… I bet she’d like this! I don’t have a food processor but looks good! Ooo what a great combo! Perfect healthy fat addition! This sounds really delicious! Love the addition of walnuts! Adding nuts to hummus is SO good!! I become hooked after I added the Wasabi and Soy Sauce almonds to my hummus a couple of weeks ago. SO, so delicious! I’m actually not a HUGE walnut lover on their own, so this would be the most perfect way for me to incorporate them into my diet! perfect! i’ve gotta step up my game next and try some different flavored nuts! That looks amazing! I’m not the hugest fan of tahini, so i need to try that! me neither! just can’t get into it so i like this alternative! Josh would love this! Thanks for sharing! What a brilliant idea!!! I love walnuts 🙂 Gonna have to try subbing them out for the tahini and give this recipe a try! Walnut hummus….different! I think I like it. Hummus is one of my favorite dips. I’m going to have to try this recipe. I do love walnuts! Never thought of using them in a hummus though. I have wanted to try making a walnut butter…yum! yum, that’s on my list too! This looks great! Im actually not a huge fan of tahini and the consistency weirds me out a little bit, so this is a great option. I have about 4 bulbs of garlic bc whenever I get a delivery from Blue Apron they always send a whole bulb instead of only the 2 or 3 cloves I will need, so I was just wondering what to do with them the other day! roasted garlic is the best answer 🙂 so good! That’s such a great idea to include walnuts in hummus. My husband would love this! This sounds absolutely incredible! I can’t wait to try it. thanks katie, let me know how you like it! I love walnuts in my salad, or with yogurt, but the best way to eat them is in brownies or banana bread! I love the idea of putting them in hummus, and I have also seen them in pesto instead of pine nuts. thanks for letting me know! i’m working on it! This sounds absolutely wonderful! I love that it doesn’t include tahini – hate having to buy an ingredient that I only use for one recipe and then store until I want to make it again! me too! this is the perfect solution! I have never tried making hummus. Adding walnuts would be a great addition. Thanks for the suggestion! Damn, this post just made me so hungry for some hummus! I’ve never tried a hummus that utilized nuts, but it sounds like it would be fantastic. I, actually, despise walnuts…however, I think I could handle them in this hummus! I use them when I make an avocado sauce for pasta and, as long as they’re chopped up in my food processor, I’m good to go! 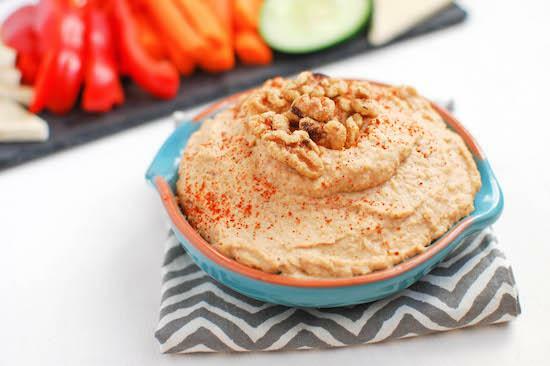 Such a great idea to use walnuts for hummus! And roasted garlic! Oh yes. Pinning! [WORDPRESS HASHCASH] The comment’s server IP (67.23.254.89) doesn’t match the comment’s URL host IP (141.101.125.46) and so is spam. [WORDPRESS HASHCASH] The comment’s server IP (209.17.114.78) doesn’t match the comment’s URL host IP (206.188.192.200) and so is spam. [WORDPRESS HASHCASH] The comment’s server IP (69.195.124.113) doesn’t match the comment’s URL host IP (199.83.129.203) and so is spam. [WORDPRESS HASHCASH] The comment’s server IP (23.239.19.156) doesn’t match the comment’s URL host IP (104.28.13.48) and so is spam.